Ideal For Single and Multi-Zone Ovens, Furnaces and Kilns. The Series 2000? 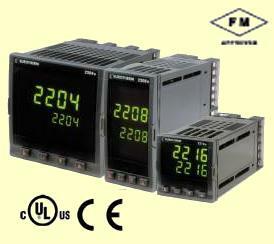 FM family consists of the 2204FM, 2208FM, 2216FM and 2132FM alarm units. The Model 2216e is an accurate indicator and alarm unit with one, FM compliant, alarm relay output fitted as standard. It has two optional outputs 1 and 2. Output 2 can be fitted with a second FM alarm relay. Output 1 can be fitted with either: dc retransmission of PV, an additional alarm relay output, or an alarm acknowledge input. A communications option is also available. The 2208e and 2204e FM alarm units have two FM compliant, alarm relay outputs fitted as standard. In addition they has two optional outputs 1 and 2. Output 1 can be fitted with either: dc retransmission of PV, an additional alarm relay output, or an alarm acknowledgement input. Output 2 can be fitted with an additional, non?FM compliant alarm relay output. A communications option is also available. The FM compliant relay outputs are configurable as absolute high or low alarms. They are fixed as latching alarms, de-energised in the alarm state. It is not possible to configure them otherwise. A universal input circuit employing patented Instant Accuracy? technology with an advanced analog to digital convertor samples the input and continuously corrects it for drift. This gives high stability and rapid response to process changes. High noise immunity is achieved by rejection of 50/60Hz pick-up and other sources of noise. The input covers all thermocouple types, Pt100 RTD linear millivolts or milliamps or DC volts. Input filtering from 1.0 to 999.9 seconds is included.